Extra! Extra! We're happy to announce that we're playing a handful of shows this summer and we're skipping around a bit! Don't miss your chance to see us play at Kid's Day @ Guthrie Green in Tulsa, OK on June 8th or at the Play Date show @ Lakehouse Music Academy in Asbury Park, NJ on June 22nd or..... drum roll please.... at Lollapalooza on Aug 1st & 2nd in Chicago, IL. Let's have fun in the sun this summer TOGETHER! More details on the SHOWS page! Since the release of our children's book, I Went for a Walk, we've had the absolute pleasure of visiting, performing and bringing our Author/Illustrator program to almost 40 different schools across the country. It's always a moving experience for us and we always see the tremendous positive impact it has on students, teachers and staff. We have files full of amazing thank you letters, drawings and notes from students, teachers, librarians and parents that overwhelm our hearts. We are always looking for opportunities to share what we do and who we are to kids everywhere. If you are a parent or educator and you're interested in booking us at your local school please Contact Us! We'd LOVE to hear from you! Here's a shot from our most recent school visit where we performed an entire interactive Play Date set. With the help from an amazing staff and an extraordinary music teacher, these students had some of the best rhythm and musical talents we've seen to date! We were so impressed and can't wait to visit again! I Scream for Ice Cream was a really yummy tour! We came back just in time to play a show in Boise to celebrate Mother's Day called "Shake What Your Mamma Gave You!" We played our first show with local DJ Instructor at The Boise Rock School, DJ Gladwell. He rocked those tables and we enjoyed playing with him. 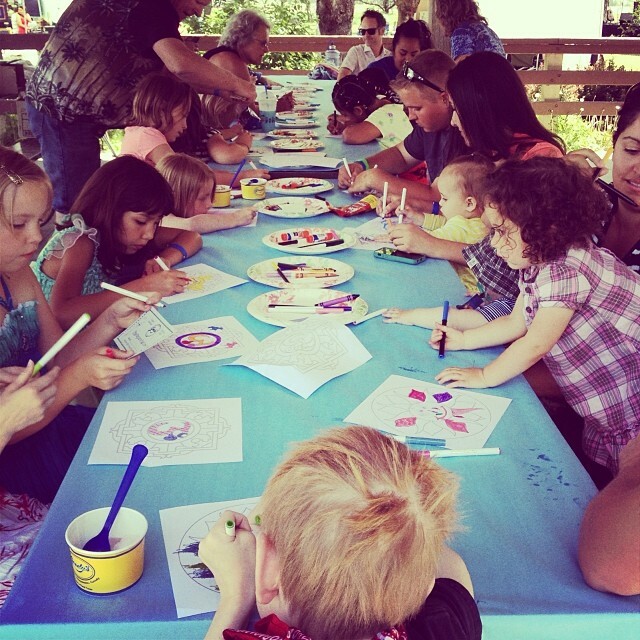 The following weekend, we played a festival called the Eagle Island Experience which was also great and featured Mandala art classes for kids by our friend and artist Dr. Uma. All in all, lots of love and as always lots of fun! We are headed to the great Northwest again! You'll have to meet us for an Ice Cream Date and a rock show because we're playing a handful of locally owned ice cream shops called Full Tilt in Seattle and we're playing a wonderful May Day festival in Portland at The Kennedy School. We're heard a lot of great things about The Kennedy School and we're looking forward to exploring the grounds. 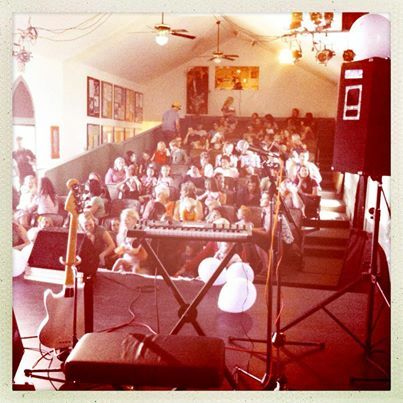 We had so much fun at this years Treefort Music Fest. So many great bands and so much great FOOD! Yum! This festival has such a great energy and everyone involved was SOOOOO NICE!!! We hope to be returning to many more in the future! 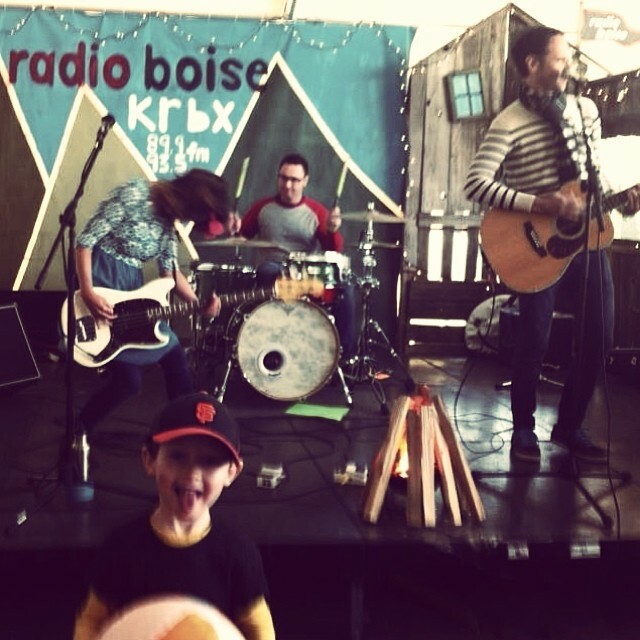 We'll be doing our very best to bring KID FORT to life with our very good friends at Radio Boise. Saturday and Sunday we'll be playing 2 sets for a total of 4 shows! Whoohooo! Really looking forward to being part of this awesome festival. 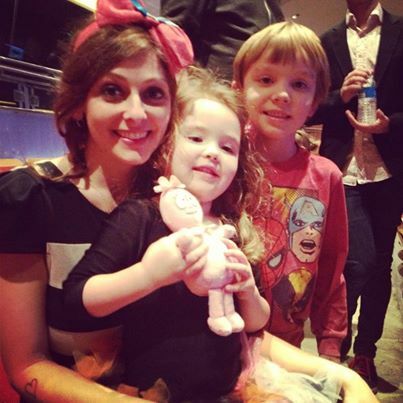 A little love from WXPN's Kids Corner! We got a fun twitter message today from WXPN Kids Corner! They featured Play Date's very own "Anyone Can Sing" and we are STOKED! Kids Corner is a live, interactive radio show for kids hosted by Kathy O'Connell and produced by Robert Drake, that has earned over 23 broadcasting awards including a George Foster Peabody Award and a Major Edwin Armstrong Award for Creative Use of Radio. Play Date is in Hawaii working on some new songs about all kinds of things. What do you like to sing about? 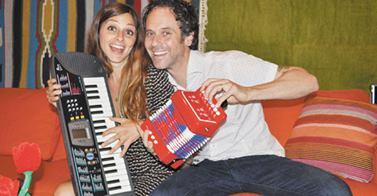 We're already working on songs about Fruit & Vegetables, Colors, a fox called Stevie and Owls! We are really excited to share these new songs with you when they're finished. Until then, enjoy this lovely collaborative drawing by us and some of our favorite family friends. 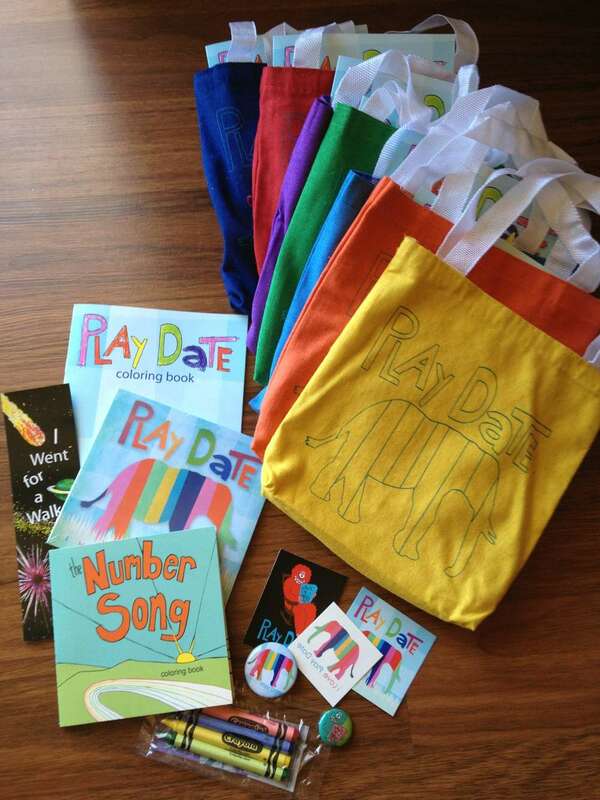 Play Date merchandise available online! We have some new merch items now available online! If you missed buying something at one of our shows or if you just want to buy the perfect gift for your little people friends, no worries we got you covered here! Play Date in your TOWN! Time to Rock the great NW! We're heading out to the great North West to rock you all silly! We get to stop at some of our favorite places and see some of our favorite faces! Porchlight Coffee in Seattle, WA, Treehouse Children's Boutique in PDX and a fun family party at Shamrock Tattoo in Spokane, WA! That's right folks! We've been asked by the music masters at iHeartRadio to create our own "Guest DJ" playlist featuring over 100 songs we love to rock out to. Check it out and have a dance party with the whole family. Guest DJ: Play Date click it and turn it up!! We also just saw this fun and sweet interview spotlight from the Austin City Limits Music Festival w/ kids. Read and enjoy! Another monster good time in McCall and Boise this past weekend! We really can't say it enough, we love our IdaHOME and all the great people we know here. It's so great to play these shows and see so many familiar faces. Thank you for your loving support, it's always so nice to be home. Special thanks to our awesome drummer Chris and our special guest Amritha Vaz on keyboards! You guys bring double the fun! It was so great to be part of the ACL Music Festival this year. This was the first year that the festival was two weekends long, so we played a total of 4 shows! It was a blast and it was so GREAT to meet a handful of other great kids music acts at the Austin Kiddie Limits area. Beyond that, we got to check out some other amazing bands like The Cure, Depeche Mode, Lionel Richie, Phoenix, The Joy Formidable, Blind Boys of Alabama, and many many more. We actually just named him that. We're sure he has a much cooler "foxy" language name but for now we've named him Stevie. It's gotta nice ring, don't you think? We have a looming suspicion that Stevie is actually a girl. Oh well, he sure is cute! Our fox friend is wild, lives in the woods and occasionally comes to visit. We give him treats and talk to him. He's not tame at all but always very gentle when taking goodies from our hands. We have to be very cautious and careful not to move to quickly or Stevie could get very frightened. Favorite treats?! Eggs! Play Date goods at 44* North! We talk to SwingWhistleZing about some of our favorite summertime activities! 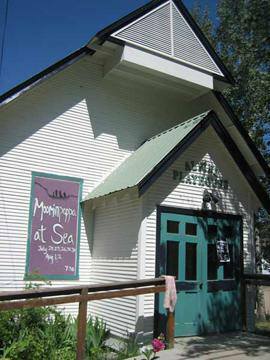 We performed at the sweetest little playhouse in McCall, ID called the Alpine Playhouse. It was a lovely time and a sold out show. We're definitely going to try and make this show happen at least once a year! Thanks for all the LOVE, McCall. It was first show in our new hometown and we couldn't have felt any more welcome! This area of Idaho and and all it's natural beauty is such a big part of our creative endeavors. It's the place we come home to re-charge and we were so happy to show you a little of what we do. Yay! Thanks! We're playing Austin City Limits Music Festival! Come October, we will be playing 4 shows at the Austin City Limits Music Festival and we can't wait! We're honored to be part of the Austin Kiddie Limits linup for this years festival. We hear nothing but great things and we certainly love Austin! There are a ton of amazing bands at this festival and we're excited to check a lot of them out. Here's our schedule for both weekends and remember, kids 10 and under get in free with a paid adult ticket! See you in Austin! Here are some flowers for all the moms out there! Thank you for all the love and everything you do. You've got the biggest job in the biz! We're on a trip in Guatemala! We met so many lovely people so far and started exploring the ancient ruins of Tikal National Park! Tikal is situated in the northern part of Guatemala and our guide Nixon told us that Tikal was the capital of a conquest state that became one of the most powerful kingdoms of the ancient Maya. We've been on a few hikes already through the jungle and climbed the steps of many of the temples while listening howler monkey's. Here are some photos from the trip so far! Oh my goodness, we're having way too much fun with all our new friends in Gabbaland! 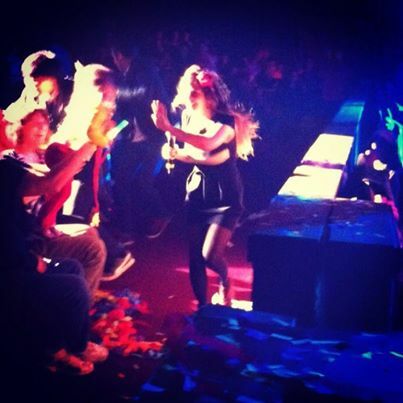 All the shows have been so much fun... we just don't want it to end! Biz taught us a bunch of beats and DJ Lance, Foofa, Muno, Brobe, Plex, Toodee, taught us so many songs and dances! We hope we get to spend more time with our new friends in the future. For now, we'll just enjoy every moment! Exciting news! We've been invited to perform with super music friend Mike Park on a handful of Yo Gabba Gabba Live dates in NJ, CT, NY, ID & CA! See you in Gabbaland! We had a really great string of shows to celebrate our new album. It started off at The Crux in Boise with a Halloween event to also benefit TRICA (Treasure Valley Institute for Children's Art). Lots of fun costumes and great sing a longs. We'll definitely be back soon Boise. Next, we were off to the California border where we stopped in the capital city of Sacramento. Here we visited one of our favorite schools for a performance and book-reading. We LOVE performing for the kids in schools. We usually do a split program of an Author/Illustrator book reading then we rock out with the kids and even include them in the process of song writing! It's always so much fun. We think it's so important and essential for young people to see actual HUMANS making music and singing in front of them... and with them of course! It's really wonderful to be part of some of the first experiences some of these kids are having. It's almost magical. Thanks! After our school stop, we played a few more shows in Santa Barbara as part of the New Noise Festival, Ventura and Los Angeles! All of them were a blast and we're starting to collect some awesome collaborative drawings from every show. I know we'll find something great to do with them! Fun mention about Vroom Vroom Vespa Tour and Play Date in Rookie Mag. Thanks! We had a blast chatting with our new friend Ronnie Scalzo this afternoon. Click the picture for a link to our interview and live in-studio performance of RAD and GREAT DAY! It sure was a great day and we hope to chat more with Ronnie again soon! We are so excited to announce the official release of Imagination. We hope you like it as much as we do! It's filled with lots of love, fun, sweet harmonies and rockin' times. Dance, sing and let this music bring you together in goodness. Dance Party!!!!!!! Here's some fun reviews! Dance Like a Monster Video is Here! The time has come to Dance Like A Monster everyone!! 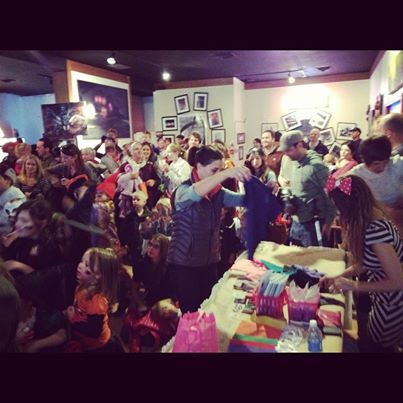 Check it out, we had a blast with THE GHOULIGANS! on this one! Remember, Sharing is Caring! Love, Play Date. We Love The Boise Weekly! We're excited to announce that we will be playing a handful of record release shows in Asbury Park, NJ and Boise, ID! Come celebrate the release of our new album, Imagination and show us your best monster moves! Both shows will have music, fun, games, balloons, prizes, face-painting, a screening of our new animated version of I Went for a Walk and a if that's not enough already... we will actually be playing all of these songs LIVE!! Woohooo! We're so excited! Here's the link to both facebook events! ASBURY PARK and BOISE! See you there! We also created a book! For those of you who may not know, Greg and I also authored and illustrated a children's picture book called I Went for a Walk. It's an imaginative adventurous story about exploring the earth, beyond and even into an imaginary inner space! You can check out the animated version right here! We travel to schools, book festivals and libraries from time to time and talk to kids about being an author and illustrator AND just how important our imaginations are! We play selected Play Date music and encourage the kids and the adults present that they can do anything they set their minds to. We always leave these visits with our hearts full of the amazing things the kids express to us. If you, your school, or local library is interested in having us share our program drop us a line. 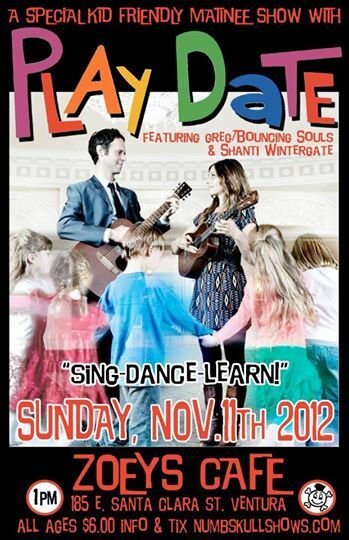 We're excited to announce that Oct 9, 2012 is the official release date for Play Date's album Imagination. Writing and recording this album has been an awesome experience from beginning to end. Big hugs and thanks goes to our dear friends, fellow Bouncing Souls bandmates and Souls family. Pete Steinkopf, for recording and mixing these tracks perfectly, Michael McDermott for lending his musical skills to the drums and percussion and Zak for collaborating on this awesome artwork. Special thanks goes out to Mike Park (Fun Fun Records) for giving us extra nudge we needed. Get stoked! More fun news to come! Our first official show at Pouzza Fest in Montreal and it was a blast. 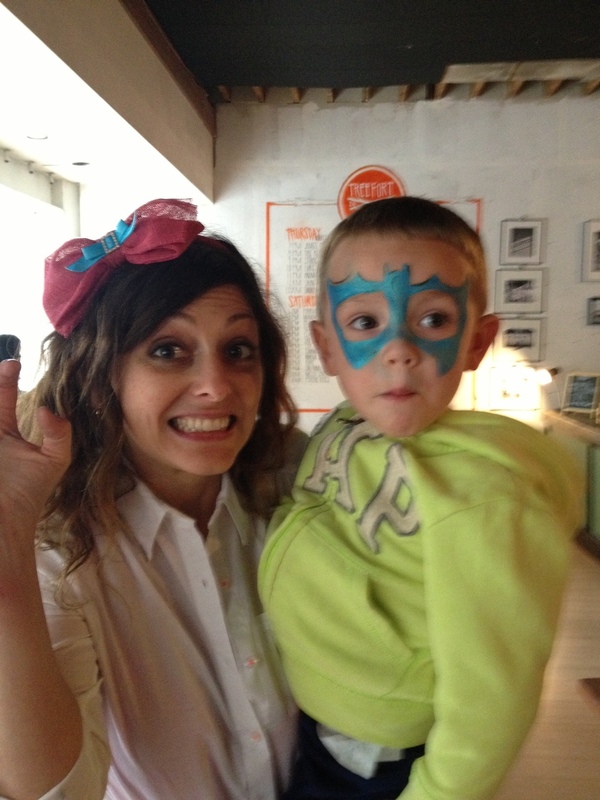 Pouzza Bambino was a huge success! 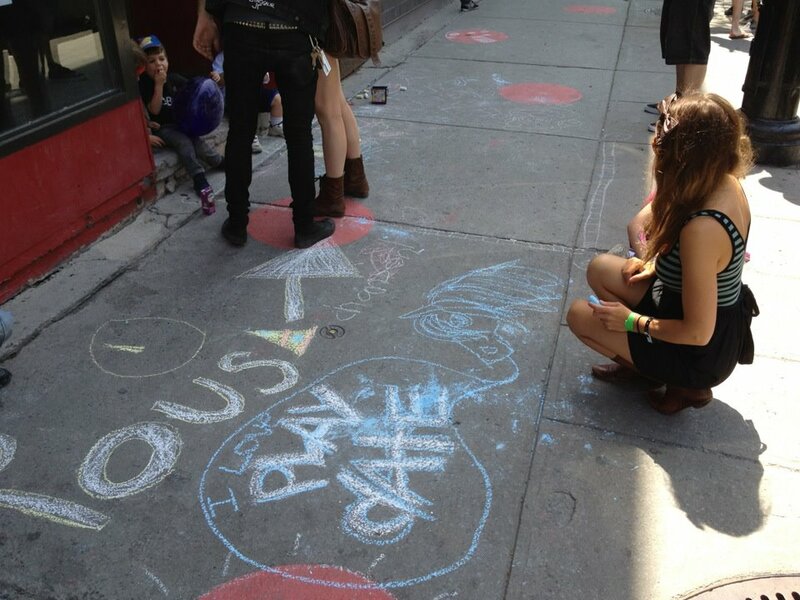 Here's a fun shot of some of our chalk drawings. We love Montreal! We just had a blast shooting our new "Dance Like a Monster" music video and meeting some super COOL monsters! Can't wait to share it with you! While we're waiting for it to be completed, we'll share some fun photos from the shoot! Can't wait to see everyone's sweet MONSTER DANCE MOVES when we play this song LIVE!